In fall 2016, our community responded to threats of flooding throughout Eastern Iowa. During this time, United Way’s 2-1-1 service received more than 5,400 calls for assistance. The Emergency Volunteer Center worked with local organizations to respond to major clean-up efforts in our community. LAP-AID also helped expedite local response, management of volunteers and donations, and provided resources for long-term recovery. In addition to these programs and services, the direct actions of volunteers in our community helped more than 190 households. 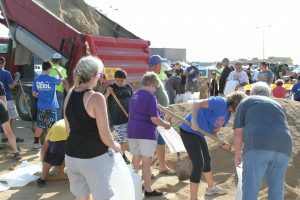 As we reach the one-year milestone of the flood, here are some highlights from a few of the volunteers who truly made a difference in keeping their neighbors safe. 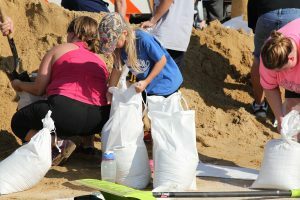 “I spent Saturday morning in NewBo and the Paramount Theatre, and then headed to the old K-Mart location to fill sandbags. It was nice to see so many people working together. The sandbags were going out as fast as we could make them. 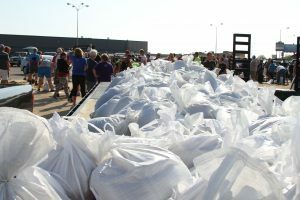 Most homeowners or haulers tried to make their own bags, and were thankful when they realized there were volunteers around to fill bags and make their job a little faster. “I wanted to help with flood efforts, even though we didn’t experience flooding in our residence. Since our children didn’t have school for the week, we wanted to show them how we could help our community since we were not directly affected. Each day, we helped different walks of life. Our first day, we drove around neighborhoods that were sandbagging, and offered them food and water. The following day, we helped with a food line at Prairie High School. When nobody showed up to eat, we distributed the food in our community, first to the firehouse and then to the Red Cross at St. Paul’s. The next day, we collected food, blankets, and crates for animals housed at CVHS. The final day, we helped an expectant mom, displaced by the flooding, by offering to help pay for a hotel room. We also joined a group to feed police officers by organizing a baked potato bar. “After taking 13 hauls of sandbags, the final house I visited belonged to a single mother. Since she couldn’t find a babysitter, she wasn’t able to go out to get sandbags. I pulled up to her house, and asked if she needed help. She came out to my truck, and was so thankful.